In this interview Hong Kong activist Au Loong Yu analyses the cooperation between China and authoritarian countries along the BRI route. What are the motives for the different parties to join the initiative and are the agreements sustainable? Au answers these questions and also gives an overview on impacts of the BRI inside China. Stiftung Asienhaus: Where do you see the main drivers for BRI: economic crisis, crisis of legitimacy, geopolitical ambitions? Au Loong Yu: I think the answer is “all of the above”, although the weight of each of the three factors is very different from each other. Right now there is no economic crisis as the state came to the rescue of the stock market sharp fall in 2015, just like what it once did in 2008-9 crisis. Yet one must take note of the fact that the basic problems of these crisis have not been fixed at all. We mean the long term economic imbalances brought about by the particular growth strategy of devoting an incredibly high portion of national income to capital investment while suppressing consumption. If we look at the share of final consumption in China’s GDP, although it is now a bit higher than previous years after the government’s attempt to stimulate domestic demand for many years, it still stood at only 39 percent in 2016, not only much lower than the world average (and also much lower than low income countries), but also significantly lower than its own previous record of 48 percent back in 1960. Hence China suffers from a typical economic imbalance of over-accumulation and over-production. More than ten years ago, the government already frankly admitted that this was compelling them to seek overseas investment so as to solve such imbalance. The BRI is only a more recent mega-project serving the same purpose. When China became the second largest source of outbound FDI in the world in 2016 this also meant that China had significant overseas interests to defend, particularly when its investment emphasis was on infrastructure and therefore takes a long time to generate profit. To achieve the goal the government necessarily ignores its officially stated policy of non-interference in other countries’ internal affairs, and does the opposite so that it can effectively promote its share in the world market while also moving up its status in the global value chain. The increasing tension between the US and China when the latter is emerging as a major global power must also be considered. This tension compels China to strengthen its ties with other countries especially its neighbours, hence the BRI. In relation to legitimacy, the CCP is well aware that since the fall of the Berlin Wall, the only ideological weapon in its possession is Great Han nationalism. BRI, as a project of “making China great again”, will undoubtedly be helpful to the CCP‘s efforts to win a new legitimacy. Stiftung Asienhaus: You know Chinese history – why is the narrative of the ancient Silk Road so attractive for the Chinese government? Au: It helps the Chinese government in two ways, domestically and internationally. Twice in China’s history the ancient Silk Road experienced its most glorious time, namely during the Han dynasty and the Tang dynasty, when China’s empire was very prosperous and its territory stretched deep into Central Asia, hence cultural and economic exchanges between China and countries west of it reached new heights. China’s silk and other products made their way deep into Europe. It is no accident that Han Chinese were called “Han” and “Tang” as well. For instance China towns in all major cities in the world are literally called “Tangrenjie”, or “Tang people’s street”. Han and Tang and the ancient Silk Road, all combined will naturally promote a pride of “Chineseness”. These images thus work in favour of the Chinese government’s grand project of Chinese nationalism and a “harmonious society”. This is the domestic dimension. Secondly, the ancient Silk Road during the two dynasties also helped two of the world’s religion, namely Buddhism and Islam, make their way into China. Buddhism is particularly influential in China to the extent that it took root there and then branched out. One of the streams evolved into a kind of Buddhism with “Chinese characteristics” – the Zen school. 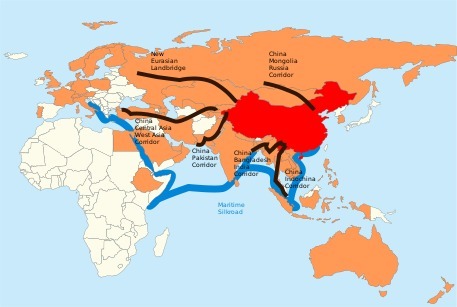 Hence the Silk Road image is also associated with peaceful and friendly cultural exchanges between China and other nations, which is beneficial for China’s BRI. Stiftung Asienhaus: Are authoritarian regimes strengthened by BRI? Au: In terms of foreign policy the Chinese government does sometimes favor authoritarian rulers or conservative governments over leftist or progressive counterparts, as the former is more likely to be free of democratic scrutiny and therefore allows more secret deals between China and those authoritarian countries. This may be the case for China’s friendship with Russia and many Central Asian countries. Even for Western countries the CCP sometimes might favor conservative parties over those which might be a bit more progressive and open. For instance, the CCP has been more likely to favor the British conservative party over the labor party, as the latter may be more critical towards the Chinese human rights record. Previously the Chinese government feared that the British Labour Party might favor more political reform in Hong Kong before the return of sovereignty than the Conservative Party was willing to carry out. It probably carries the same logic in relation to BRI. Those authoritarian countries in Central Asia are easy targets for the Chinese government when it comes to trade talks etc. Stiftung Asienhaus: These close links with authoritarian rulers – would you consider them a strength or a weakness, at least in the long run? Au: I think it works both ways. For instance the Chinese government’s close links to Central Asia and Russia helps the former to continuously get valuable oil and gas even if sometime in the future the US decides to forcefully disrupt the oil trade route between the Middle East, South Sea and China. In essence the BRI is intended to be an economic second front in the contest between US and China for global leadership. Surely everything comes with a price. The BRI and the need to bribe foreign despots are very costly and one must look into the possibility of China’s over-stretching its reach and hence it may suffer some backlash in the future. Also these strong links to despots could work in the opposite direction when these links begin to antagonize local people and result in the growth of anti-China sentiments, and in some extreme cases even bringing the anti-China opposition to power. Surely for the moment Chinese money does mainly work in favour of both the Chinese government and those authoritarian governments receiving Chinese loans or aids. We need to monitor the constantly changing situation. Stiftung Asienhaus: Nationalisms in China today – is it different from earlier decades (Mao, Deng Xiaoping), more “assertive”, more aggressive? Au: Yes it is, because it is more state-sponsored than it was previously. In Mao’s era, the official line was still critical of nationalism, even if it was merely verbal. It claimed that it was only promoting “patriotism”, not nationalism. In Deng’s era, which was a period of phasing out ideological debate, the CCP’s foreign policy was to “lay low and wait for a better chance”, hence the state was very cautious not to promote nationalism in any high profile way. This has changed in the past ten years, especially since Xi Jinping took power. The CCP’s nationalism has becomes a state led project, with the state pouring money into the media and TV and movies to boost the China model. Stiftung Asienhaus: Impact of BRI on the working class in China – is it benefiting like the working class in Germany/Europa did after the Second World War (“workers aristocrats”), or will it suffer? Au: I don’t see how it may benefit the working class in China, as there is no commitment to genuine collective bargaining and workers’ right to independent organising on the part of the CCP, let alone the German style co-determination. In fact, precisely because of the BRI it will continuously draw domestic resources out of China and from its poor population and into the BRI countries and its mega projects. Au: If there is a “Chinese characteristic” in relation to China’s supreme leaders, then it is the fact that they all want their own “signature projects”. For Mao it was the Great Leap Forward and the Cultural Revolution. For Xi who wants to imitate Mao, it is the re-creation of the China Empire with the BRI as its signature project. Stiftung Asienhaus: China as the new hegemon – and Xi Jinping the hegemonic ruler? Do you see countervailing forces? Where does the CPC stand now after the reversal of several ‘balancing’ rules like the term limit? Au: Xi removing the term limit plus installing measures to concentrate all power in his hands allows him to rule despotically. But it does not mean there are no more countervailing forces. Factions within the party still exist and therefore one cannot rule out the possibility that opponent factions may become more outspoken in the future, especially when the debt mountain becomes unsustainable, or the economic crisis becomes unmanageable, or there is a confrontation with foreign powers etc. Even after such an intense triangular struggle between Xi Jinping, Hu Jintao and Jiang Zemin, Xi has to include Hu’s “signature thought”, namely “scientific outlook on development”, into the amendment of the constitution, along with Xi’s own thought. (Jiang’s “the three representatives” was already put into the constitution), meaning that he still has to pay verbal respect to his adversaries. If Mao himself could not really disband factions and stop factional fights, and his work was undone by the oppositional faction after he died, it is hard to imagine that Xi, who had done nothing great before he came to power, can ever exterminate all opposition within the party. On the other hand, the logic of despotism necessarily gives rise to more new factions and factional fights regardless of old factions. For every bureaucrat promoted because of his/her link to Xi or his cliques, there are even more officials who are left behind forever, giving rise to discontent and the formation of new cliques. This issue will become even more acute when Xi grows older and when the struggle for succession becomes intense. As far as the BRI is concerned, there is already a thin layer of critics who fear that the project may in the end prove too ambitious and may over-stretch China’s ability. In terms of foreign policy there are now obviously two schools of thought, one which argues that, instead of confronting the US, China should continuously adapt itself to US hegemony, while the other school argues that the US should be confronted. This kind of disagreement will not disappear because of Xi’s concentration of power. Actually in times of crisis Xi’s personal power will also become a target held responsible for all possible failures. Stiftung Asienhaus: Do you see any connection between BRI and the internal repression against society in general and civil society organisation in particular? It is Chinese despotism itself that links the two together. As the BRI is Xi’s signature project means that the government will take any criticism against the BRI very personally, and treat these criticisms as not only targeting the BRI but also targeting the great leader Xi. This scenario surely will silence many people. Au loong Yu was an original member of Globalization Monitor, a Hong Kong based organization. He left the institution some years ago and works as an publicist ever since. His book "China Rise: Strength and Fragility" (2012) was translated into Japanese and French.